After the age of 40 (actually 35! ), your hormones are pretty much in control of how you look, feel, think and behave. You are entering the peri-menopausal years which can last up to 17 years! These years can be a real roller coaster for many women – fatigue, weight gain, mood swings, brain fog, anxiety, insomnia, PMS, hot flashes are just some of the common symptoms women can experience. We all want to trim down our waist sizes and lose that extra inch (or two or three) that hangs over the waistband of our pants. In fact, our vanity is often the driving factor toward achieving optimal health. But it can be more than vanity, excess body fat, especially excess belly fat can be a serious health risk. It can increase inflammation that can contribute to a number of chronic health issues including type 2 diabetes, heart disease, and even Alzheimer’s. However, even women who eat right, exercise, and take care of their health often find belly fat the most difficult obstacle in their journey to ideal weight and health. Bigger bellies (i.e. higher waist-to-hip ratios) are found in both slim women and overweight women. This drives home the point that belly fat is not a simple matter of gaining or losing fat. Calories matter, but hormones matter more when it comes to where we store fat and how to attack stubborn areas of body fat unique to us. This means that if you have a lot of belly fat, it could be an indication that your hormone levels are out of balance. If you are a woman doing everything right and still struggling with female belly fat—especially if you are a thin woman suffering from belly fat, it’s important to understand that the primary issue for you is stress management. It’s NOT too many calories. It’s NOT too many carbs. It’s NOT because you are not doing enough exercise. It is stress!!! In fact, the dieting mentality of eat less and exercise more is exactly the wrong approach to take to attack stubborn female belly fat. This simply makes the physiological stress greater. When I use the term “stress”, it is important you understand what I mean. For some reason, we equate stress with emotional upset. So we think that if we do not feel anxious or depressed we are not stressed. This is a dangerous misconception to have when it comes to belly fat. Over-exercising, chronic and extreme dieting, worries about body image, demanding work schedule, relationship tension, and sleep deprivation are all forms of stress. Research has shown that women suffering from stubborn belly fat are more stress reactive and less able to adapt to stress than women without it. In other words, for a woman suffering from stubborn belly fat she can’t get rid of, another hour in bed may be a better strategy than another hour on the treadmill. There’s a reason for stubborn belly fat and this is where I help clients find success. Contact me today to start conquering your belly fat. 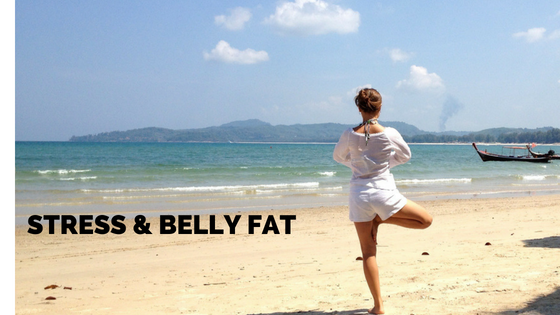 In the meantime, here’s some 5 tips for helping you to reduce your belly fat…. things like a massage, spa time, sauna, hot Epsom salt baths, restorative yoga (not power yoga), tai chi, naps, and meditation. Anything that relaxes you and calms down your overall physiology. Walking is one of the healthiest things you can do, and it is one of the few physical activities that lowers cortisol if you do it in a leisurely way. What is leisure walking? A slow walk—3.0 or less on a treadmill. It should feel relaxing and give you time to take in the scenery, which lowers cortisol further. Aim for 10,000 steps a day. Prioritize Sleep. You will have to make a choice about whether your late night TV habit is more important than a flat tummy, because sleep deprivation is a huge issue for belly fat. If you can’t sleep, then nap. If you can’t nap, then meditate. If you can’t do any of that, then simplify your life so that you can. Stress management has to be made a priority. Add More Protein to Your Day – Protein reduces your appetite and makes you feel fuller longer. Eating protein-rich foods can help to maintain your muscle mass. Protein will help boost metabolism and also boost the thermic effect of food which means your body works harder to digest it than carbs or fats. It’s time to lose the “go hard or go home” mentality to losing belly fat. Keep it simple. Follow the tips above and and over time, you will watch your belly fat disappear. It’s time we recognized that there is no one-size-fits-all plan, and each woman’s response to exercise and diet is completely her own. That’s why I’m excited to share my FREE Online Metabolic Type Assessment so that I can help you discover YOUR unique, fat loss blueprint. After you take the assessment, you are immediately emailed the results. It’s Quick and Easy! Please check your SPAM folder if you don’t get the results right away. And please respond with any questions that you may have.